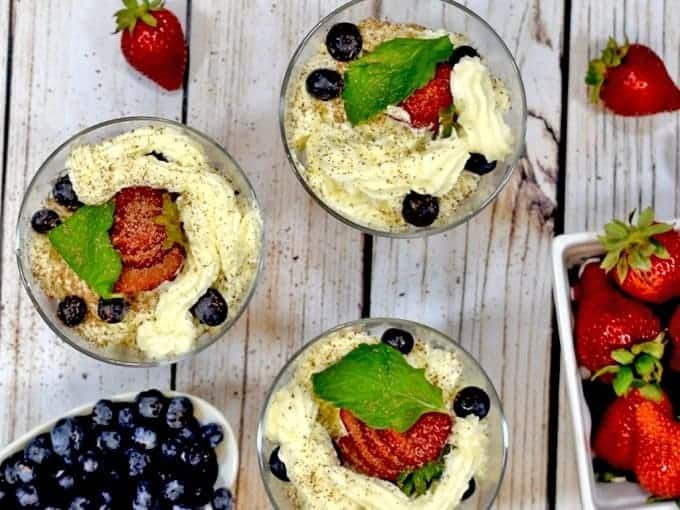 Mascarpone Mousse with Strawberries and Blueberries - Red White and Blue Summer Delish! 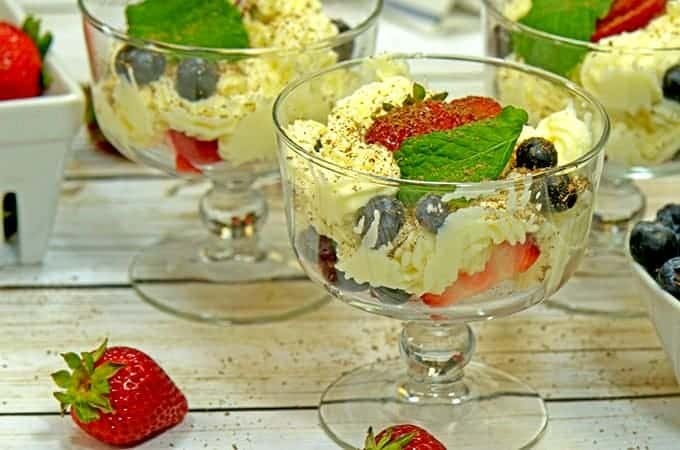 Mascarpone Mousse is an easy and dreamy dessert that serves as the perfect base for seasonally fresh strawberries and other summer-friendly fruit. Hello summer, it is so nice to see you again! The season brings picnics, pool parties, fireworks, and family gatherings. It also brings the season of summer food. Many times, if we are attending a function where we have to bring a dish to pass, we tend to use the same recipes that we’ve used for years. And let’s face it, sometimes we just grab a bag of chips to bring. 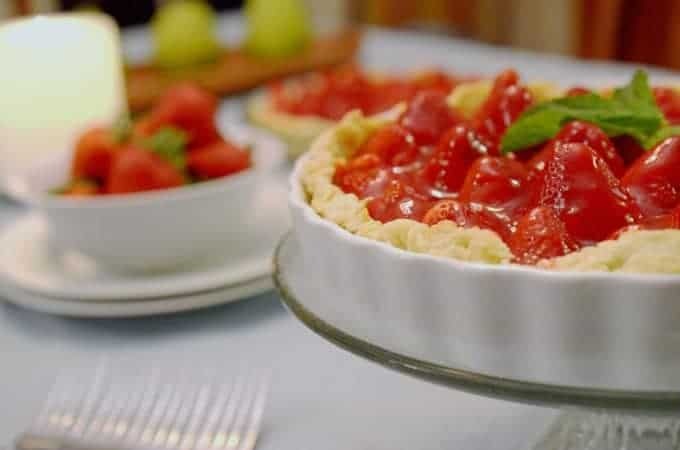 However, if you are in need of a dessert that’s not strawberry shortcake, then this is the recipe for you. Let me introduce you to our mascarpone mousse that we have laced with strawberries and blueberries, making it the perfect red, white, making it ideal for this fourth of July holiday. Trying to come up with a new summer treat, I wanted to get away from traditional strawberry shortcake. Don’t get me wrong. I love strawberry shortcake just as much as any red blooded American. Yet sometimes that standard gets a bit boring and let’s face sometimes s a little soggy towards the end. 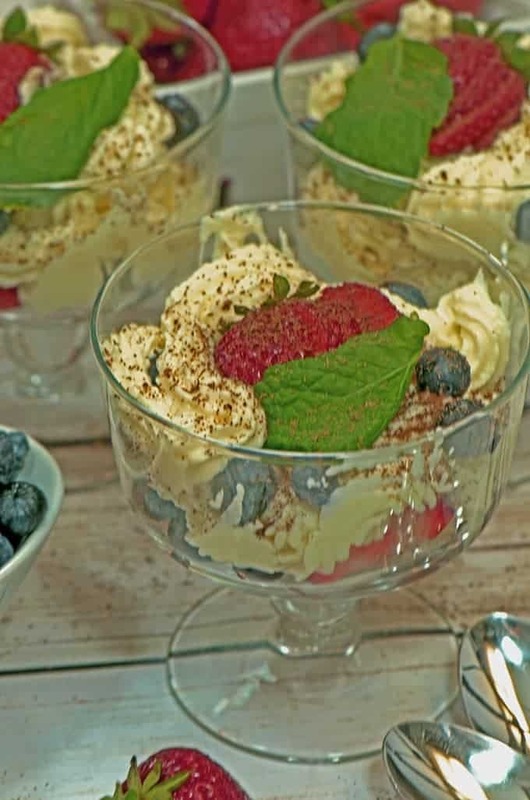 Not so with this light, creamy, and delicious mascarpone mousse. 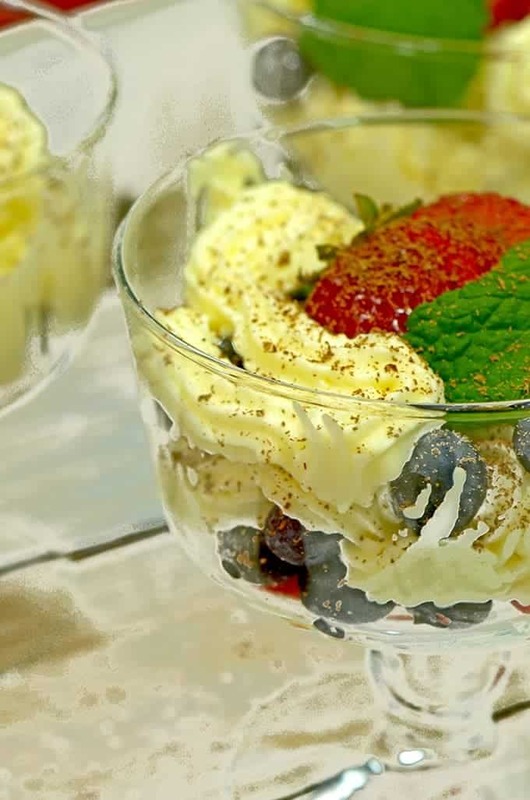 Because summer brings fresh fruits such as blueberries and strawberries, this recipe allows the fruit to shine. We decided not to add any additional sugar to the berries or macerate them, because this is the only time of the year that the fruit will be in it’s prime and full with it’s own natural sweetness. 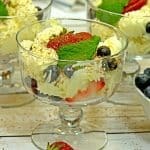 This dessert goes together in a snap and it will hold up well in your refrigerator for a day or so. However, because it is so easy put to put together, you can do it while your guests are at your house. Get them involved in chopping up the strawberries or whipping up the cream. If you happen to have to sip a bit of cold Chardonnay or Sauvignon Blanc throughout the process, so be it. 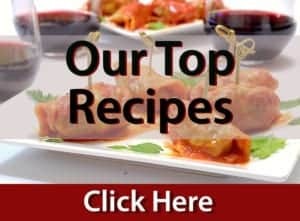 Click here for more strawberry recipes from Platter Talk. Summer is all about great weather, good friends, and of course certain fresh produce that only comes around once a year. This Strawberry Mascarpone Mousse is the perfect way to celebrate the season in all its glory. 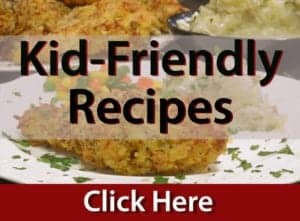 You’re going to enjoy this recipe, I just know it! -Scott. Inspired by All Day I Dream About Food. In large mixing bowl combine the cheeses along with the vanilla and 4 tbsp sugar. Beat together until creamy. In another bowl, combine the remaining 2 tbsp sugar with the heavy whipping cream and beat until stiff peaks are formed. Fold the mascarpone mixture into the whipped cream until thoroughly combined. 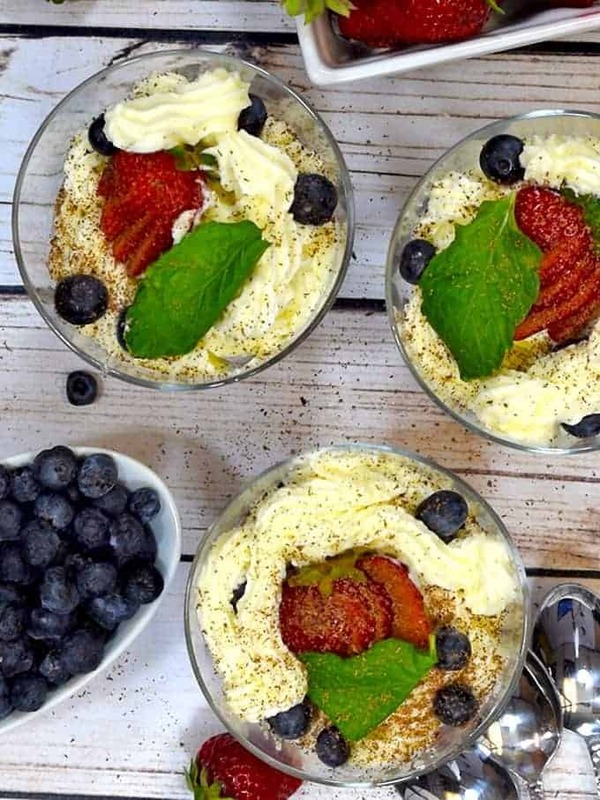 Spoon or pipe into 4 dessert cups, on top of alternating layers of strawberries and blueberries. Serve immediately or chill in the refrigerator for later. If possible, make the whipped cream in a metal bowl that was in the freezer before using. This allows for a cold surface for the whipped cream while being made which will optimize the it's texture and structure. Garnish with dark chocolate and fresh mint, if desired. I know what you mean about the strawberry shortcake. 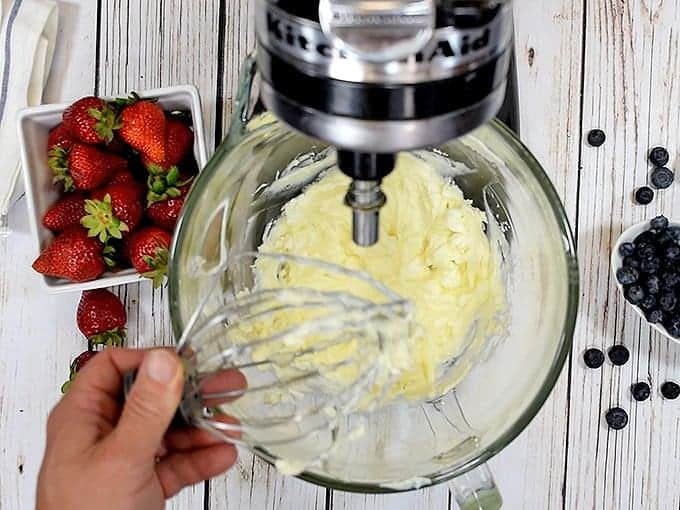 It’s so wonderful – especially if you make your own shortcakes. But it’s nice to have an alternative, and this certainly fits that bill. It sounds unusual and delicious. Thanks for the comments, Jeff – we are loading up with strawberry recipes this weekend!